Donna Karan again the star with his pre-fall collection 2012/2013 of shoes, a very varied, and shows us again how the American designer adore surprise. Beginning with the choice of forms of each model and then past patterns, materials and color combinations, Donna Karan wanted to make his collection of pre-winter a small masterpiece with eccentricity and style, as we had already figured out by looking at the few models on the catwalk months ago. We discover what's new line. The line of boots Donna Karan favors forms with high stiletto heels, and leg member. Among the models are in fact special boots with heel, toe, platform front and back of the leg in black leather, while the rest of the uppers in suede in various shades ranging from brown to black, green oil, fashion color which apparently marks the next cold season, to dark blue. A line full of personality! Much wider choice in the field of ankle boots, Donna Karan thinks very special versions with platform and high heel, complete with strings twisted along the central panel. Dominant feature in the line of ankle boot is the combination of different materials in contrasting color, from black leather with brown crocodile, all'alligatore red leather panel, through shades of cobalt blue, bronze and gray for most models whimsical. The ankle boots are offered in both versions lower than in those high on the ankle, always marked by contrasts in tone and very interesting material. Even without strings models have unique features, such as tips cap-toe patent leather and fur inserts not bad. 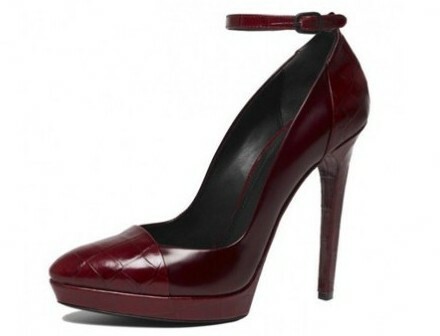 In the line of pumps and Donna Karan are placed decolletes mary jane's most elegant and sophisticated. We speak of models with the characteristic pointed cap-toe patent leather clad as the heel, while the upper and designed in glitter black, bronze or silver, a narrow point of returning pumps to exploit contrasting with the alligator skin matte, tones of burgundy, gray and classic black and still sought after models in satin with leather. High heels and platform several inches outside of the models for the evening, often characterized by the glitter in dark tones, patterns that are completely opposed to the flat shoes that Donna Karan wanted to even animal prints in his latest collection.